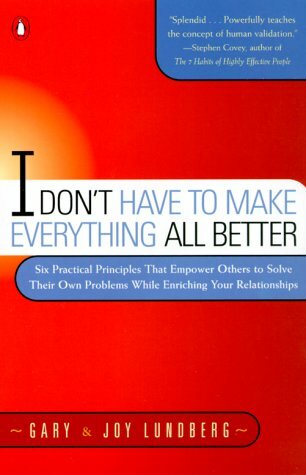 Six Practical Principles That Empower Others to Solve Their Own Problems While Enriching Your Relationship. This is a recommended resource when one's young child has Borderline Personality Disorder. Lundberg addresses the dilemma that arises when family members expect us to solve their problems . This is a very easy book to read - written by a very caring grandparent who works as a marriage counselor. Lundberg, discusses six principles that can be used to empower family members to solve their own problems. I Don't Have To Make Everything All Better is a "how-to" book for people seeking to shed the no-win role of "fixer" with a family member. This is a recommended resource when one's child has Borderline Personality Disorder. Lundberg addresses an all too common dilemma that arises when family members expect us to solve their problems for them. . In his book, Lundberg, discusses six principles that can be used to empower family members to solve their own problems. These constructive tools focus on helping others help themselves and on you being able to enrich your relationship with your loved one. This book outlines techniques for dealing with tantrums, whining and guilt in a way that communicates empathy. Lundberg shows how to communicate that you really care for your children, that you understand them, and he shows you how to help them develop their own problem solving skills. If you ever find yourself saying "quit whining and just do it!" or "you're over reacting" this is a book for you. Lundberg encourages "validation," a technique for improving one-on-one communication that involves careful, empathetic listening to another person's feelings without judging, criticizing or attempting to solve his or her problems. Lundbergdemonstrate this technique's effectiveness in a variety of situations and provide readers with valuable coaching and specific responses, cautioning that authentic validation is grounded in respect and honesty, or else it might be seen as manipulation. The book includes many recognizable examples from Lundberg's experience as parent of five. Some sample situations may be resolved a bit too easily for some tastes, but even the most jaded reader is bound to learn from the material, which holds special appeal for parents of young children. The examples given in the book have been criticized by some as being overly simplistic, and the book has religious and conservative overtones that may offend some. Nonetheless, the techniques and principles are sound. Gary B. Lundberg, MA, MFT is a grandparent of five. He is also a licensed marriage and family therapist. He and his wife, Joy, have co-authored the popular books on improving relationships Married for Better, Not Worse: The 14 Secrets to a Happy Marriage, and I Don't Have to Make Everything All Better: Six Practical Principles that Empower Others to Solve Their Own Problems While Enriching Your Relationships. Lundberg formerly served on the behavioral medicine staff of Utah Valley Regional Medical Center. Before entering his marriage and family therapy education and practice, he worked as an account representative for IBM and as CEO of an electronics firm. He also served as a fighter pilot in the United States Air Force for seven years.